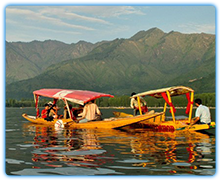 Arrival at Srinagar airport, our representative will meet you and transfer you to the Houseboat. Rest of the day is at leisure in the houseboat amid the extraordinary beauty of Kashmir Valley. In the evening, dinner and overnight stay in the Houseboat / Hotel. After breakfast, proceed for local sightseeing tour of Srinagar which includes Mughal Gardens, Nishat Bagh, Shalimar Bagh, Hazratbal Shrine and Shankarcharya temple. In the afternoon return to the houseboat and dinner and overnight stay in houseboat / Hotel. After early breakfast, we take you for a full day excursion to Gulmarg(60kms/2hrs drive).Gulmarg is mostly famous for its golf course with 18 holes and has got one of the best ski slopes in the world. and full day enjoy in gulmarg. 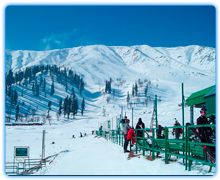 After Breakfast full day sightseeing and Gondola Ride Gulmarg , Overnight stay in Gulmarg. Today after breakfast, check out from hotel and travel by surface to Pahalgam, Pahalgam , Once a humble shepherd’s village, it is now Kashmir’s one of the premier summer resort, cool even during the height of summer. Pahalgam is not just a hill-station it is a recreation resort and also the starting point for the annual Amarnath Yatra held in summer. Upon arrival at Pahalgam, check in to the hotel. Rest of the day is at leisure in the lap of nature. Dinner and overnight in the Hotel. After breakfast You may go for a short walk or shop a round late afternoon return. to Srinagar. Overnight at houseboat / Hotel.